Will you just look at all the rubbish on the pitch at Elland Road? And for once, I am talking actual litter that was blowing around in the wind and not the quality of players on the pitch. …and the whole situation got much worse during the game when we went 1-0 down after 25 minutes. It was all set up to be one of those days…with the only upside being that at least we had the excuses ready for why we lost. Just on the stroke of half time though, we equalised. A ball went high and bouncing into the box, everyone missed it, Kebe fumbled a shot and McCormack pounced and scored. Suddenly there was some belief back in the 31,103 fans who had turned out. The second half was a complete turnaround and we played a whole lot better. Amazingly we started doing the one thing that I think is the key to us winning more games…we started closing players down instantly. As soon as we start doing that, things look brighter. We create much more chances, put pressure on and more often than not, and win games. Five minutes into the second half, Kebe scored after picking up a great backheel from McCormack. He chipped it over a defenders’ leg and slotted it past the keeper. Our fourth game on 73 minutes. This time Cameron Stewart did well to get into the box and put a ball across to the back post and McCormack was there to smash the ball home and score his hat-trick! What a 24 hours for a guy who was almost sold last night! Mowatt wrapped up the win by getting our fifth when the Huddersfield keeper took out his own defender and Mowatt lobbed the ball into the back of the net from a distance. A fantastic atmosphere in the ground and a great win. It was exactly what was needed after everything that happened last night. 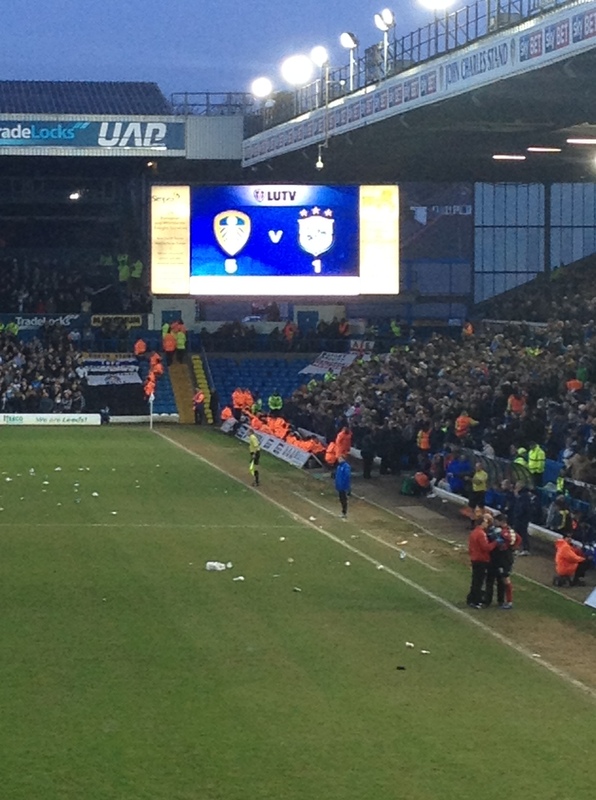 One thing though, is that the Leeds fans are naturally giving the new owner a hell of a lot of stick. In my opinion, and the opinion of a few who sit around me at Elland Road, it’s worth noting that Cellino hasn’t actually done anything too bad yet. Yes, there’s been a whole lot of confusion caused by the entire situation, and some backtracking (it was announced that McDermott will be manager after all), but at the end of the day, GFH are an investment bank…they were always going to sell the club to the highest bidder…and if Cellino is the highest bidder and does gain control of the club, shouldn’t we be backing him and his money to take us forwards…? This entry was posted in Uncategorized and tagged huddersfield, Leeds 5-1 Huddersfield, leeds united, Ross McCormack, Yorkshire Derby. Bookmark the permalink.